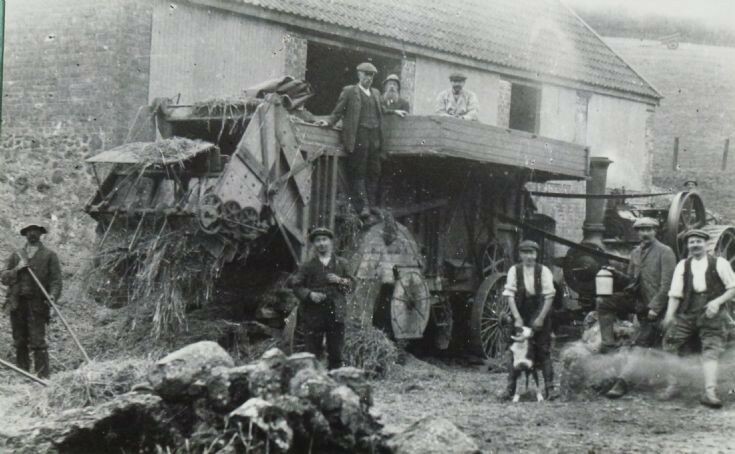 Traction Engines - Threshing on the farm. 1914 is the year and Lidwell Farm, Dawlish the location. Traction Engine over to the right doing what comes naturally supplying power to the threshing machine belt driven of course. I wonder if this was the engine and thresher that I used to see as a small child in the early 1950's going along Exeter Rd. in Dawlish? Sometime in the early 1950's the traction engine broke something major and was put into a layby (yes, they had them even then and its still there!) on the side of the A379 road at the Dawlish end of the Cockwood straight mile on the near and on the same side of the road as the Half Moon Garage (now called Cockwood Service Station) a bit further along. The traction engine and thresher sat there in the layby for several years exposed to the elements. The boiler and fittings of the engine were covered over with a tarpaulin but the thresher was just left out in the open on the side of the road. Then one day, I noticed that both had disappeared! I wonder what happened to them. Anyone know? Were they saved or cut up? I fear the latter. I often wonder what happened to the traction engine as it was my only exposure to road steam apart from steam rollers. Now they are another story as I remember them surfacing the A379 and the Dawlish Warren road into the late 1950's. Added by Mark on 19 February 2013.